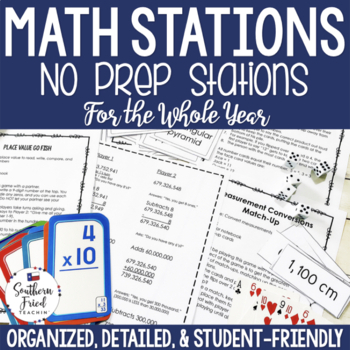 A growing bundle of 75 NO PREP fun & engaging Math Stations for 3rd - 6th grades for the whole year. This can be a great time saver for you since all you have to do it print and go! Each station includes detailed student directions, which makes it easy for you while you work with small groups. This is a growing bundle which means I will be adding more math stations as I create them. Grab this bundle now! As the bundle grows, so will the price! Each station activity has the objective, materials needed, and easy to follow student directions. 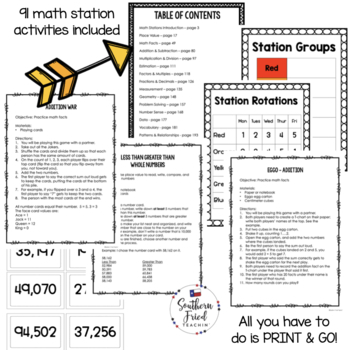 This bundle of math stations has 75 ready-to-go stations from throughout the math curriculum. I created these math stations based on what my students have struggled with in the past couple of years. You can mix and match the stations, choosing the ones according to your students' needs. They are great for repeating throughout the year. My students would love it when one of their "favorites" came back into the station rotation. Many of these stations work great with my GAME BOARDS FOR TASK CARD PRACTICE. Do you teach 4th or 5th grade math and want even more math products while saving a lot money? 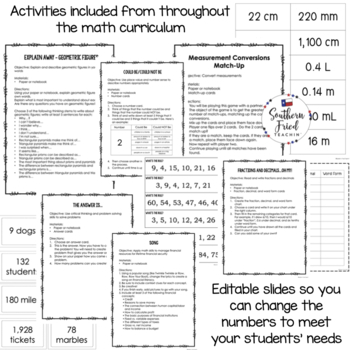 Then check out my 4TH & 5TH GRADE MATH BUNDLE and save over 50%! Please visit my website at Southern Fried Teachin’ for more ideas, photos, and freebies!